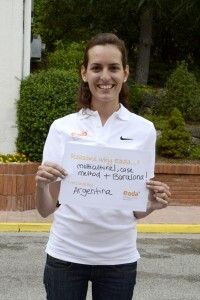 Argentinian Maria Florencia Magistocchi shares her experience in the EADA-Residential Training Centre modules. Maria has a degree in Administration and Finance and 4 years of work experience. The personal development modules focused on leadership have taught me the importance of identifying a clear objective when getting to know and leading a team. I have also learned that it is crucial that all team members are well-informed and committed. Communication is key to organising groups effectively and ensuring that all members are working towards the same goal. A common mistake is assuming that everyone understands information in the same way. The modules in the EADA-Residential Training Centre are very practical, giving us the opportunity to reflect individually as well as in groups. In the Centre, I was also able to meet participants from other Master programmes, expanding my networking opportunities within EADA. Without a doubt, the modules in the Residential Training Centre have been essential to both my personal and professional development. These modules helped me identify things I could improve about myself and taught me how to go about making the improvements. The modules in the Residential Training Centre were crucial for me because I don’t think you can be a successful manager without good leadership skills. Marketing and a Javelin, nothing in common?